The last part of Ludwig Von Mises great work Socialism is entitled “Destructionism” and is not, formally, about socialism at all. In the main body of “Socialism” Ludwig Von Mises proves that it is impossible (yes impossible) for socialism to equal capitalism economically, let alone to exceed capitalist economic performance (as socialists had been promising for over a hundred years) socialism must always produce inferior results. Now the language of Ludwig Von Mises may sometimes suggest that he believes that socialism can not function AT ALL (i.e. that it can produce nothing – no goods and services), but that is a misinterpretation of the position of Mises (which is partly the fault of Mises himself – who sometimes lets elegant language get in the way of fully stating the correct position, as I detest such things as “grammar” I do not make this mistake). By copying the prices of the capital goods in “capitalist countries” socialist countries can make a crude approximation of “capitalist” economic activity – never very good, but certainly not no economic activity at all. However, in the last part of his work “Socialism” Ludwig Von Mises turns to “Interventionism” government spending, taxes and regulations which (supposedly) improve on the work of voluntary cooperation. “Market forces”, of supply and demand, are as my friend Mr Ed often points out – partly a matter of physical reality (weather and so on), but mostly a matter of human choices (voluntary interaction). Government intervention (by spending, taxes and regulation) far from improving economic and social outcomes can (as Herbert Spencer pointed out in “Man Versus The State” in 1883) only make things worse than they otherwise would be. Ludwig Von Mises takes great pains in “Destructionism” to show that the fashionable polices of his time (and our own time) of government spending, taxes and regulations make things worse, not better, than they otherwise would be. And that the supposedly new idea of interventionism – is, in fact, a return to the absurd fallacies of past centuries that the Classical Economists of the had exposed. Has the penny dropped, do politicians (and the public) yet understand that government spending, taxes and regulations make things worse (not better) than they otherwise would be? Sadly no – most politicians and most of the public do not understand. The above picture is the most commonplace thing in the world. There is a gift wrapped car in a shopping mall. Obviously, this is a prize in a competition, designed to encourage people to visit the shopping mall and spend money in the shops. The car is first generation Daewoo Matiz – later known as the Chevrolet Spark – an old design now but one of the cheapest cars in production in the world. It’s an utterly awful car to drive, but it is A NEW CAR!. 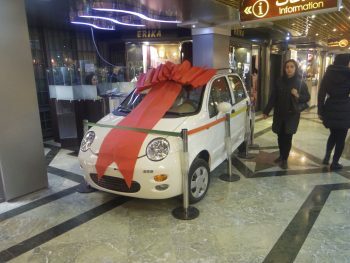 If you are a shopping centre owner, then the main thing is that it is a new car. That it is the cheapest new car in existence is not the point. The point is that the prize in our competition is A NEW CAR! It’s a city car, also. If you are in a place where the traffic is bad enough, a lack of acceleration and an inability to drive above 80km/h matters less, anyway. There is, of course a story. I live in London by myself. My family are in Australia. London is cold, dark, and deserted between Christmas and New Year, and it can be depressing to be here by yourself. Although I don’t need much of an excuse to go travelling at the best of times, I particularly try to get out of town, ideally to somewhere where there is no Christmas. Last year this led to my finding myself in Tehran, Iran. I didn’t quite entirely escape Christmas – there was still a Christmas tree in the lobby of my hotel – but I mostly escaped Christmas. Certainly, the traffic gridlock on December 25 was horrendous, as indeed the traffic gridlock is horrendous in Tehran on most days. There is a metro in Tehran, but Tehran is a sprawling city which makes it only so useful, a little like the metro in Los Angeles. Tehran is a sprawling city of multi-lane freeways and horrendous traffic in a basin surrounded by mountains, a little like Los Angeles. In the expensive suburbs of north Tehran, it’s not especially hard to find yourself in achingly hip cafes that might almost be in Silver Lake, too, but let’s go there some other time. The whole “enormous, car-centric sprawl with an immense freeway system” makes Los Angeles a polluted city by American standards, but in all honesty it is much less polluted than it used to be. Modern cars are more efficient and have more advanced emissions control systems than was the case even a few years ago, and like all developed world cities, the air in Los Angeles is much cleaner than it once was. In Tehran, though, imagine a rapidly growing city, that despite sanctions is getting richer. Demand for cars is high, but due to those sanctions Iran is unable to import cars from many industrial countries. Cars stay on the road longer, which means the pollution will remain worse for longer than in many other cities of similar levels of development. Sanctions are uneven, so it is much easier to do business with carmakers in certain other countries than others. When you look around, you find that most of the cars are Korean, or French, or will be oddly familiar things or brands you haven’t heard of. This gets us back to the overtly Korean car in the shopping mall. → Continue reading: Globalisation is very weird. Looking back, it’s hard to overstate the cultural significance of GamerGate: it marked when the Post-Modern Left suddenly and unexpectedly lost control of social media, right at the point where the influence of social media actually started to matter. In a sense, it was the second wave of discontent that started with the arrival of anti-MSM blogs in the immediate aftermath of 9/11, but within a very different internet environment compared to ‘The Golden Age of Blogging’ 2001-2010. As has often been the case in military campaigns, when one side becomes greatly overextended, they only realise they have lost the initiative when they seek to advance and experience a completely unexpected reversal: a result that may seem obvious and perhaps even inevitable to a historian looking back, but which was far from obvious to the people on the ground at the time. So certain was the Left that they had won the culture war, so confident with the established media under their effective control that ‘truth’ was theirs to declare, that they gave up on any pretence of objectivity. After all, their enemies had been swept from both airwaves and print (I sometimes cannot tell the difference between the Times and the Guardian and the Economist). And so they began to manoeuvre with the assurance and arrogance of an army under an umbrella of complete air(wave) supremacy, a supremacy that suddenly proved to be illusory because opinions had moved on-line. I could just as easily be talking about Brexit or Trump, for it was a widespread tone deaf lack of introspection by establishment folk that made those things possible (albeit for very different reasons)… but the way I see it, GamerGate was the canary-in-the-coal mine. And almost no one on the Left noticed that particular canary had fallen off the perch and dropped dead. I imagine when the history of Brexit and Trump are written, GamerGate will probably be a forgotten footnote (and it is indeed a mere footnote), but I think it was (and sporadically still is) a more significant series of protracted skirmishes in the culture war than a lot of us Old Farts realise, a very successful clash that radicalised many younger people in ways that horrify the Tranzi Left. And their response every time has been to double down as if nothing has changed, eventually stripping words like ‘misogynist’, ‘racist’ and ‘nazi’ of any meaning in the process. In all the discussion about the Greek exit from the Euro I see a lot about wealth and poverty; about whether more damage would be done to the economies of Greece, Europe and the world by “austerity” within the Euro versus a default and a return to the drachma. These are the questions of cost and benefit that it is respectable for world leaders to discuss. Discussion gets heated, I hear – voices are raised and cheeks flushed with anger. But the thing that really sends the blood rushing to a Prime Minister or a Chancellor’s cheek is pride, not money. Pride matters. Pride, shame and “face” in the oriental sense set billions of Euros coursing this way and that in a way that mere economics could never manage. Greek pride finds German diktats hard to bear – but not so unbearable as facing the fact that Greece did not join the Euro but rather was let in by condescending officials who turned a blind eye to obvious lies, like a university turning a blind eye to plagiarism in order to keep up the diversity quota. The Germans were proud of their Deutschmark, prouder still of their own nobility in giving it up for the greater good (with a little frisson of shame at the sinful pleasures of that export boom), and this is the thanks they get? Bitterest of all is the wounded pride of the Eurocrats. Their sure touch was meant to gently shape history as the potter’s touch shapes the clay. Only the clay slid off-balance on the wheel and it has begun the trajectory that will end when it hits the wall with an almighty SPLAT. Shapers of history really hate almighty splats. Hurts their pride, you see. I really hate shapers of history. A few thoughts on Climategate. The climate is clearly changing. There is nothing unusual about this. The climate is always changing. I’m happy to concede that the trend in recent decades has been to hotter temperatures. Again, nothing unprecedented about that. The world has hot periods and cold periods. The trend seems to have slowed or reversed over the last few years. This is not a short enough period of time to prove anything, but it does make you wonder how strong the trend is. Some of the data analysis that purports to show the trend has been presented in ways that deliberately or otherwise state the data in such ways that appear to indicate the trend is stronger than it is, and/or choose starting points and data series lengths that appear to show the trend as more abnormal than it is, in my opinion. Again, with the impact of human activity, I am happy to concede an impact exists. There is a lot of human activity – it must have some impact on the climate. Whether it is a significant impact is another question. Having those two thoughts, you look for a correlation, and find one between CO2 in the atmosphere and average temperature. One can be found, although it is not clear whether it is a causal relationship (CO2 levels vary historically before significant human activity existed, and a lot of the time CO2 increases seem to trail temperature changes rather than the other way round). So how much are higher temperatures caused by higher CO2 levels, and how much of the increased CO2 level caused by human activity? The answer to the last question is clearly “quite a lot”, but that is not an answer to the question “How much?” Is it “70%? 90%? 100%? 120%? To be able to come up with a meaningful model, we have to have a good numerical answer, and we don’t remotely. As to what impact increased CO2 levels have on average temperatures, there is much greater uncertainty. Basically you have to enter a fudge factor into your model, see how well it models the past, and hope you can then model the future successfully. A few people have created models that can just about model the past, but that doesn’t mean you have the mechanism right – it just means you have found a mathematical function that fits the points on your curve. As it is, we have a few extremely crude mathematical / computer models that suppose mechanisms that go from human activity to CO2 release to global warming. They don’t agree with one another, and they are incredibly crude. (The Earth’s atmosphere is an extremely complex system. These models only have a tiny fraction of its complexity). They have a poor record of predicting the future. The science of global warming ultimately boils down to saying that “The level of warming is unprecedented”. “Human releases of CO2 into the atmosphere are unprecedented”. “Therefore, the second causes the first”. This isn’t an inherently ridiculous thing to say. If climate change really is unprecedented then we would look for other unprecedented things as likely causes and human activity would be the likely one. We could then look for mechanisms and solutions, but we would largely be doing so with our eyes closed. In response, I received a mocking reply from a true believer, saying more or less that if I knew so much about it, why didn’t I publish papers in a refereed journal myself, and he was sure that a Nobel Prize would be beckoning. There was no attempt to address anything I said – merely an observation that what I was saying did not have the approval of the clique controlling the argument. In a way this was odd, because I was not actually claiming to know anything about the workings of the climate: only about the likely limitations of the methodology of climate scientists. As it happens, once, in another life, I was a research scientist. → Continue reading: A few thoughts on Climategate. Perhaps – the BNP? Despite its attempts to appear modern and inclusive and the soothing talk in its 2005 General Election Manifesto, of “genuine ethnic and cultural diversity” . Or UKIP? It harbours some pretty backward-looking individuals – but would they stop Britain buying electricity from France if necessary? Or, maybe, the Conservatives? Could that be a list of recommendations from one of Dave’s lesser-known policy groups – chaired by the ghost of Enoch Powell – quietly shredded to avoid “re-contaminating the Brand”? Actually, affiliates of the progressive consensus may be surprised to learn that all the reactionary policies in the first paragraph are from the Green Party’s Manifesto for a Sustainable Society (MfSS) or were adopted at the party’s Autumn Conference in Liverpool over the weekend of September 13-16, 2007 . Of course, the Green Party will protest against the accusation of reactionary politics. However, in an article critical of the G8 leaders in June, George Monbiot, (capo di tutti capi of the green movement) advised readers to judge politicians for “what they do, not what they say”. But, use Monbiot’s argument, disregard the rhetoric and look at what the rest of the BNP manifesto promises would actually do and it remains a party of racist and neo-fascist ideology – internationally isolationist and domestically reactionary. The trouble for Greens is that their manifesto pledges would result in many of the same outcomes as the BNP programme. “The Green Party recognises that subsidies are sometimes necessary to protect local, regional and national economies and the environment, and we will support them in these instances” . “Controls such as tariff barriers and quotas should be gradually introduced on a national and/or regional bloc level, with the aim of allowing localities and countries to produce as much of their food, goods and services as they can themselves. Anything that cannot be provided nationally should be obtained from neighbouring countries, with long distance trade the very last resort” . The paradox of arguing for Fair Trade while refusing to buy African vegetables because of “food miles” has been noted many times, but it is a paradox the Green Party simply ignores. According to the Guardian, Britain has two black farmers , so any policy to subsidise domestic produce and erect barriers to outsiders will, ipso facto, support white farmers and disadvantage black farmers. Even if supplies are “obtained from neighbouring countries”, white European farmers benefit at the expense of poor farmers in Africa and the developing world. “Britain’s farming industry will be encouraged to produce a much greater part of the nation’s need in food products. Priority will be switched from quantity to quality, as we move from competing in a global economy to maximum self-sufficiency for Britain, sustainable agriculture, decreased reliance on petro-chemical products and more organic production” . “To be able to fulfil all our basic food needs locally. To grow as many other products as we can to meet our basic needs (e.g. for textiles, fuel, paper) on a local or regional basis. To enable all communities to have access to land which can be used for growing for basic needs. To ensure that all growing systems use only natural, renewable inputs and that all organic waste outputs are able to be recycled back into the soil or water system” . “We are the only true ‘Green Party’ in Britain as only the BNP intends to end mass immigration into Britain and thereby remove at a stroke the need for an extra 4 million homes in the green belts of the South East and elsewhere, which are required to house the influx of 5 million immigrants expected to enter the country under present trends over the next twenty years” . I was talking to a friend this evening who noted that a bank had sent him a letter promoting a loan; confounding the pessimists who think that the days of easy credit are completely dead. He observed that the letter contained the phrase “The mill that produced this paper supports sustainable forestation”. It is hard to believe that the bank really cared that much about the source of their paper, but banks, being creatures of the market, are sensitive to their customers, and make efforts to please them. The small but noisy minority of ‘environmentally friendly’ customers that would have approved of the bank’s effort to be eco-friendly would be appeased, and the rest of the client base would care not a jot. But we are seeing more and more of these nods to the environment being enforced with the power of national governments. It is rather like what happened to ancient Rome in the Fourth Century. The first Christian Emperor, Constantine the Great, lifted restrictions on Christianity in 312, and Christianity backed by the power of the state made slow but steady gains at the expense of the old pagan faiths before the Vestal Virgins were disbanded by Imperial order in 394. I am not sure what will really qualify as comparable milestones in the rise of environmentalism as the official faith of the West, but for those of us of a skeptical nature, I think it does rather have a feel of being like a Pagan in 4th Century Rome. Sometimes it is worth plagiarising yourself. I was asked in a pre-interview chat the other day, about 30 seconds from live TV, “Why is the government doing this? ‘Terrorism’ doesn’t seem to make sense; there has to be something more to it.” It’s hard to be snappy on the point even without crazy pressure, so mumbled something about my interlocutor going to Google and typing “Transformational Government”. I do recommend it, but I have a fairly neat explanation for why Transformational Government too. Just not quite neat enough to recall and pitch in 30 seconds on a GMTV sofa at 6:30 in the morning. My answer arises from a pub conversation a while back with the post-Marxist commentator Joe Kaplinsky. He maintains “they” don’t know what they want the information for, they are just collecting it just in case it should ever come in useful, because that’s what bureaucrats do. There is much in that, but I think there’s slightly more. The slightly more is a glimpse of bureaucratic fundamentalism to rival the more explicit fundamentalisms of religious and political fanatics. The administrative class (“class” in the cultural not economic sense) in Britain, but also in Europe more generally – and from which New Labour is almost exclusively drawn – holds it as self evident that the life and personality of an individual is a unitary object capable of being better managed if only there is enough information collected and enough “best practice” followed. It is a fundamentalist faith in that if the world is out of line with the model, the world is wrong; that written rules and established methods are unquestionable from outside the tradition; and that forcing people to live within the categories determined by the faith is justifiable for a general and individual good that is evident to the elect. It’s not that control is sought for its own sake, more that they yearn for the best well-ordered and coherent society, and believe this can be determined and imposed given sufficient expertise and information. Hence joined up government. They really do believe that efficiency is achieved by connecting everything to everything else in a giant bureaucratic system. It is the Soviet illusion, dressed up in “new technology” and market-friendly initiatives that co-opt corporate bureaucracies into the dream rather than setting them up as enemies. The same people who claimed to have absorbed Hayek’s explanation of why 5-year plans can’t work during their turn away from Old Labour are too dull (or too intoxicated by the vision of the power to make a good society) to see that replacing some of the clerks with machines and the telegraph with the internet makes no difference to the basic proposition. Will Smith has expressed his view that people are essentially good, they just do bad things as a consequence of following the logical train of thought from faulty premises. And this remark has sent the Jewish Defence League into a hissyfit of rage. Now that is a very dubious interpretation of Smith’s remarks, to put it mildly. I am not sure I agree with Smith that all people are essentially good, although I do think most people are capable of good. I think that absent a biological defect, we develop towards goodness or evil or, more usually, somewhere in the middle, through the exercise of our free will in accord or in conflict with our genetic predispositions, but all people are capable of both good and evil. Some are more predisposed to good, others to evil (and a disproportionate number of evil people are drawn to politics as a career as it offers such rich possibilities for doing just that), but I do not think we are inexorably forced down either path… and thus find it hard to entirely disagree with Smith. However the theory that Will Smith is presenting is an entirely reasonable one to argue and using the example of a man not unjustly held to be the very epitome of evil seems a fair and relevant way to express his view of human nature. Without a doubt Smith is in excellent philosophical company on the issue of innate goodness and his position is a deeply Christian one. When Hitler looked in the mirror, I am sure he did not see an evil man gazing back at him. Of course he did what he thought was ‘right’ within his world view, his meta-context, which was framed by the axioms of a collectivist racist drawing on a long history of collectivist and racist thought. To Hitler ‘right’ was whatever was good for the ‘herrenvolk’ which he perceived as being in perpetual conflict with other racial groups. As a consequence his concept of ‘right’ was always going to be monstrous (i.e. the “twisted, backwards logic” of which Smith speaks). What Smith seems to be saying is that if someone had the chance to sit Hitler down and ‘unpick’ his ‘twisted, backwards logic’, then perhaps they might have been able to ‘reach’ his deeply buried innate goodness. Although I have serious doubts on that score, it is a far from unsupportable argument and in no way speaks to Hitler’s actual manifested goodness but rather the notion of an innate goodness being intrinsic in us all as a species. If you take that charitable view of humanity then of course Hitler (and Pol Pot, Stalin, Genghis Khan and Caligula) had an innate goodness buried somewhere in the deepest basement of their dark souls. That the JDL feels that is an intolerable position to take rather than just an incorrect one, makes me deduce they are probably not worth the effort of debating, particularly given their preposterous characterisation of Smith’s remarks. And although as I have said, I do not entirely agree with Smith’s theory of innate goodness, if I was him my response to the JDL would be something along the lines of “Screw you, buddy” whilst proffering the Mighty Forks in their direction. I do not know a great deal about the JDL but a brief trawl of the internet suggests to me that anyone not following certain ritual forms of abomination when discussing anything whatsoever relating to Hitler, is immediately branded as The Enemy Beyond The Pale. What an excellent way to make yourself look like a complete prat, not to mention wrapping yourself in the same psychological cloth as certain Islamofascist crazies who become unhinged at the sight of irreverent cartoons. I have argued in the past that violent repression, gulags and mass murder are not in fact the defining characteristics for a state to be ‘totalitarian’. The defining characteristic is, as the word itself suggests, that control over people be pervasive and total… mass murderousness, goose-stepping troops, waving red (or whatever) flags are merely an incidental consequence and which can be better described in other ways (such as ‘tyrannical, murderous, dictatorial, brutal, national socialist, communist, islamo-fascist etc.). As a result my view is that we in the west are already well on the way to a new form of post-modern totalitarian state (what Guy Herbert calls ‘soft fascism’) in which behaviour and opinions which are disapproved of by the political class are pathologised and then regulated by violence backed laws “for your own good” or “for the children” or “for the environment”. And so we have force backed regulations setting out the minutia of a parent’s interactions with their own children, vast reams on what sort of speech or expression is and is not permitted in a workplace, rules forbidding a property owner allowing consenting adults from smoking in a place of business, what sorts of insults are permitted, rules covering almost every significant aspect of how you can or cannot build or modify your own house on your own property, moves to restrict what sort of foods can be sold, what kind of light bulbs are allowed, and the latest one, a move to require smokers to have a ‘licence to smoke‘. Every aspect of self-ownership is being removed and non-compliance criminalised and/or pathologised. “There is nothing evil about smoking as long as you are just hurting yourself. We have to try to help people stop smoking without encroaching on people’s liberties.” […] But he said requiring them to fill in forms, have photographs taken in order to apply for a permit would prove a more effective deterrent. No doubt Julian le Grand thinks that makes him seem reasonable and sensible, because he does not want people to have their civil liberties encroached upon… and he then proceeds to describe how he would like to do precisely that in order to ‘deter’ you from doing what you really wanted to do. The reason for this seemingly strange approach is simple to understand because to the totalitarian, something does not have to be ‘evil’ to warrant the use of force to discourage it, you merely have to have (a) coercive power (b) disapprove of another person’s choices regarding their own life. That is all the justification you need, simply the fact other people are not living the way you think they should, in your presumably infinite wisdom. Notice how coercive actions imposed by state power are described as ‘helping’. We will force you to pay more, force you to go to a doctor…but we will throw your arse in gaol if you dare try to circumvent our unasked for ‘help’. The ‘paleo-totalitarian’ simply uses force if you disobey, no messing about… however the post-modern totalitarian prefers to add a morally insulating intermediate step that allows his kind to talk about ‘civil liberties’: first he gives you a nice regulation to obey and only if you dare not comply with that do the Boys in Blue get sent to show you the error of your ways. I can think of quite a few ways I would rather like to ‘help’ Julian le Grand and his ilk in order to mitigate their pathological need to interfere with other people’s lives. All for the greater good of society, you understand.